US Pres. Trump slams Iranian Pres. Rouhani's 'demented' words, promises 'consequences' if Iran threatens the US again. 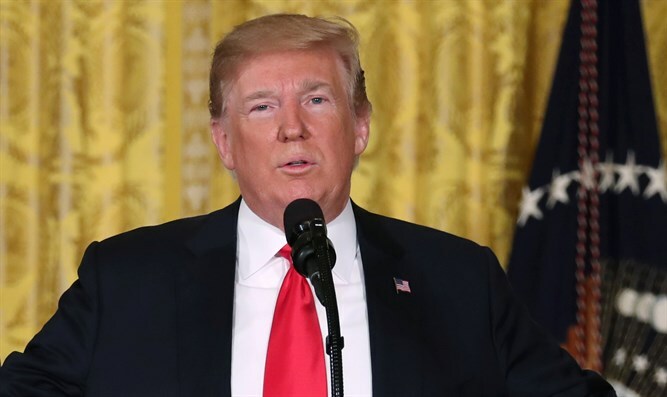 US President Donald Trump on Sunday night replied to Iranian President Hassan Rouhani threat that "playing with the lion's tail" would lead to "the mother of all wars." In a tweet, Trump wrote, "To Iranian President Rouhani: NEVER, EVER THREATEN THE UNITED STATES AGAIN OR YOU WILL SUFFER CONSEQUENCES THE LIKES OF WHICH FEW THROUGHOUT HISTORY HAVE EVER SUFFERED BEFORE." "WE ARE NO LONGER A COUNTRY THAT WILL STAND FOR YOUR DEMENTED WORDS OF VIOLENCE & DEATH. BE CAUTIOUS!" Earlier on Sunday night , US Secretary of State Mike Pompeo compared Iran's leadership to the mafia. During a California speech, Pompeo said, "The level of corruption and wealth among regime leaders shows that Iran is run by something that resembles the mafia more than a government." Pointing out that many Iranians have been protesting their government, Pompeo continued, "All those voicing dissatisfaction share one thing: they have been ill-treated by a Revolutionary regime. Iranians want to be governed with dignity, accountability and consent."